The CERN Communication group has received an award for its efforts in communicating the LHC first beam to the media and the public. James Gillies, head of the Communication group was presented the AlphaGalileo Research Public Relations Award on Wednesday, 14 October during the Euroscience Media Award Ceremony in Hannover. "It’s great to receive this recognition," said Gillies. "Of course, we had great material to work with: the LHC is a fantastic story and one that is going to get even better. Angels, Demons and black holes also had their roles to play, but behind the media interest there’s been a lot of hard work by my team. This is for them." The CERN Communication group also works with communication professionals in all the CERN Member States and major physics labs around the world through the European Particle Physics Communication Network, and the InterAction collaboration. "Without them," says Gillies, "the impact would have been much smaller." 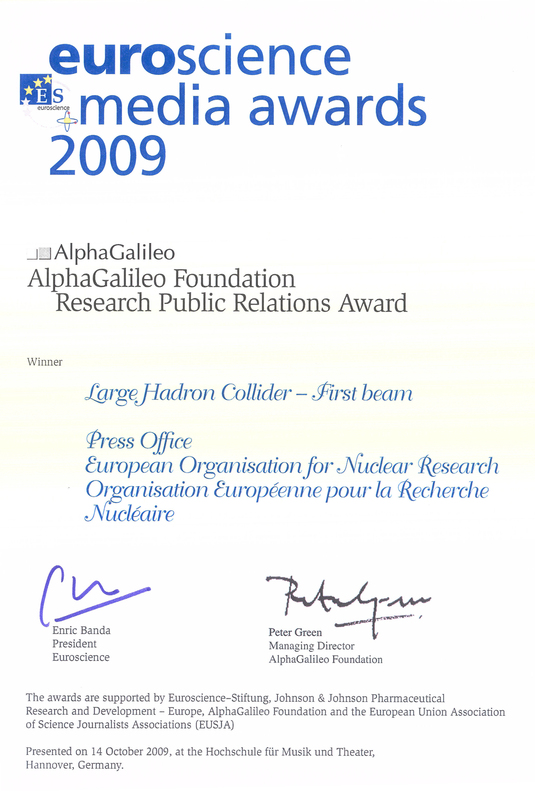 This is the first edition of the AlphaGalileo Research Public Relations Award. It is worth 5000 Euros and includes a ‘golden’ Galileo. The Communication group will be using the award to give a young communication professional the chance to join the team as an intern throughout the LHC restart period. CERN is inviting media to come to the lab for the period of the first high-energy collisions. "This marks a new challenge for us", says Gillies. "Again, we want to give journalists the opportunity to experience the reality of cutting edge research first-hand, but we also need to manage media expectations and hold their interest from the first collisions through to the physics results, which are of course what CERN is here for."